I am playing along Taheerah’s Advent Calendar Extravaganza 2016! I made a Christmas card using Clearly Besotted Stamps. This stamp set is called Joy to the World. This is an older stamp set but one of my favourite Christmas stamp set. I stamped the background of the card with the trees from the stamp set using Soft Leaf dye ink from Hero Arts. This is a beautiful muted green. Perfect for background. Soft and subtle. For the focal point, I stamped the wreath from the stamp set using green pigment ink and red details on the wreath using red pigment ink. The pigment inks are from Mama Elephant and Avery Elle. I similarly stamped the bow, die cut both of them out using the coordinating dies. I adhered them on a vellum panel using foam adhesive for dimension. I also edged the vellum with gold pigment ink. Then I adhered this vellum panel on the card front using foam adhesives hidden behind the wreath and bow. The sentiment is white heat embossed on black strip of cardstock and adhered again using foam adhesive. Then I added 4mm gold sequins on the wreath as embellishments. Thats all! Simple and easy to make. It’s not a party without a prize – and with prizes every day there are several chances to win! Today’s prize is generously supplied by Clearly Besotted so you’ll definitely want to win! Simply leave a comment on this post – then head back to taheerah-atchia.com and leave a comment there too! You must leave a comment on Taheerah’s blog as well as mine in order to be eligible to win! Don’t forget to grab the other surprise destinations from Taheerah’s blog and head over to them to leave comments there as well to improve your odds even more! You have until 23:59 EST on 31st December 2016 to enter. Lovely card! The sequins are a great touch! I love the focal points raised up to pop right off the gentle background. The curly bow matches the curly font of the sentiment perfectly. Great card. Elegant card! The background is great! Such a beautiful card. Love the colors! Beautiful card, I love Clearly Besotted stamps. Gayatri, your card is beautiful. The background looks amazing behind the vellum and the focal image is really lovely! Great job! The slight gold detail on the vellum is beautiful. Well done! Love the background and vellum. Trying to pin it, but I can't. Beautiful! I can see why it's your favorite set. such a pretty card in the lovely soft colors, Gayatri! Beautiful card. The vellum is a nice touch. Looks like a frosted window. Pretty card! Love the vellum layer to add softness. Thanks for sharing! Pretty card. Love the use of vellum. Nice background and the vellum is so soft and pretty, too. Beautiful card. I adore that sentiment font. Cheers. Very pretty card. It's colorful and bright. My favorite part is the message. I love how it's written. Thank you for sharing. Love the pretty background and your colors! VEry pretty card! Merry Christmas and tfs! Great card and fun ideas to make something alittle different! Thanks for sharing on this fun extravaganza!! when it is placed over a bold design. The wreath is so pretty. The card has a real contemporary flair! Love it! Great card–so unique with an open wreath. Lovely background and I like the red speckles added to the greenery. Beautiful card. I love the gold edge detail on the vellum – nice touch. Beautiful card with great design. Love the vellum and the sequins…all the elements just came together perfectly. 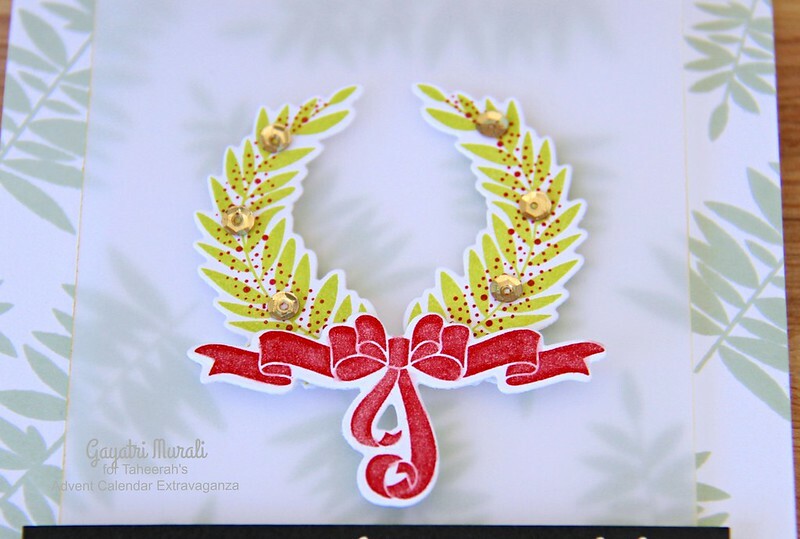 Beautiful card, Gayatri–just the style I love! That sentiment is fabulous–gotta try & get it! Gorgeous card! The focal point is so stunning and I love the font of the sentiment! Such a lovely card! The vellum and the black and white sentiment really make it stand out! Beautiful and elegant card! 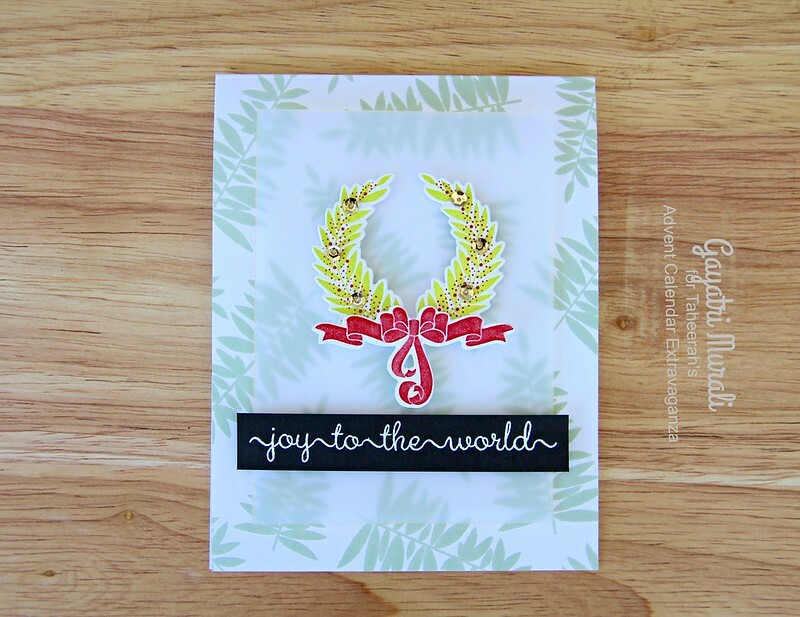 I can see why “Joy to the World” is one of your favorite stamp sets. So pretty! Love how the sentiment and ribbon are both wavy! Just beautiful!!!! A lovely background and wreath!! A lovely card that makes me feel peaceful. No better sentiment for the season. Oh how I love Christmas carols. Your car is really beautiful. Merry Christmas to you and yours. oh my! This is gorgeous…love how it POPS. Very pretty. I like the addition of the vellum. Beautiful card, love your background! This looks like such a versatile set and so perfect for Christmas. Your sequined wreath is gorgeous! Love the font of the sentiment! Great card. Terrific card…love your background and the added vellum! Beautiful card! 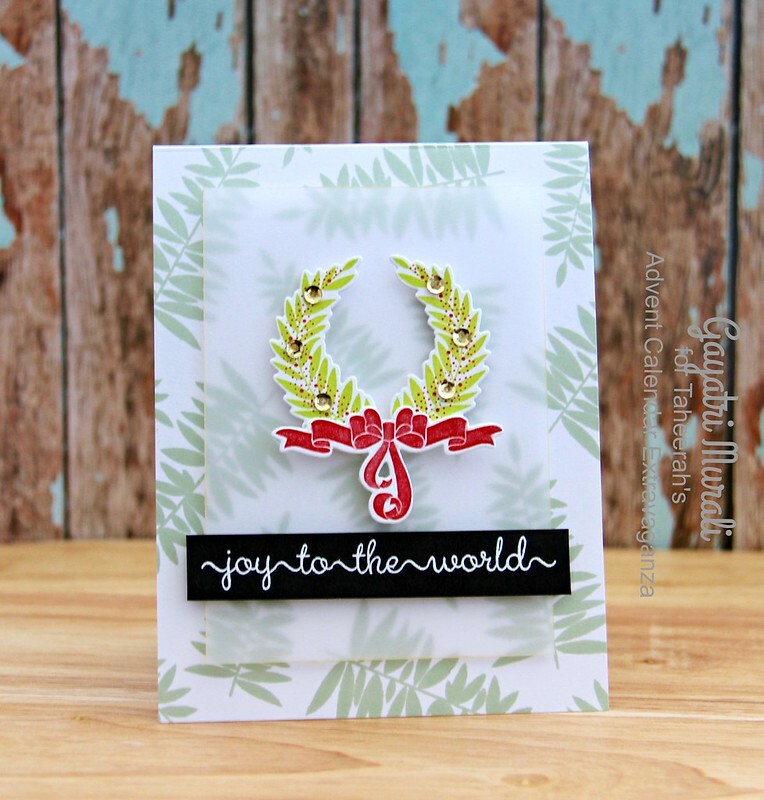 Love the vellum layer and wreath! Pretty details! Very pretty and that sentiment is beautiful. Great choices! What a beautiful card! Love the vellum panel. I really like this layout. Lovely! So crisp and love the dimension. Thanks for sharing! Lovely card! The vellum works well and that joined sentiment stamp is just my style! this is absolutely stunning and SO beautiful! i love the traditional greens and reds! and that vellum is a perfect touch! Lovely card. I love the back ground and how it is partly diffused by the vellum. Very pretty! I can see why it's a favorite set. That bow is especially lovely. What a lovely card! Wonderful background and sentiment and I love the little touch of gold around the vellum! The red berries of the wreath is such a nice touch! Just beautiful!! Love the vellum – I always forget how lovely vellum looks. Thanks so much for the inspiration!! Beautiful card – love the layers! How pretty! Love the soft background & the vellum! Such a pretty card. Love the background paper and the vellum makes the wreath pop. Great job. Merry Christmas!! Your wreath is lovely!!! I love what you created–so very pretty. Very elegant card- love the vellum overlay! Gayatri – this is a lovely card – I always forget to use vellum, and it is so pretty as you have used it both to soften the stamped background and as a background for your focal point. I really like this. Thanks for the inspiration! Wonderful card with subtle colors and love the touch of sequins. Superb! A beautiful card with soft yet vibrant colors. Thanks for sharing. Vellum always adds elegance to a card. Beautiful Christmas card! Great colors! Unique card design, simplicity at its best. Beautiful card. Wonderfully contemporary and elegant. Love how you put all the elements together! Love the wreath and sentiment!! I like the dimensional look of this card. Very classy. I love the simplicity of it. And the font that joy to the world is in, is awesome. Such a cute card. Great job. I love the sentiment from the style of the font to the white on black presentation. The vellum rectangle is a perfect touch too. Beautiful card! Thank you so much for sharing. The wreath reminds me of the Roman head dress for winners and that bow is exquisite! The card is a WINNER! Beautiful and unique. Fabulous holiday card! Your card is simple but oh so beautiful. Just my style! Very beautiful! A perfect card for those who live in tropical areas. Happy Holidays, Gayatri! Such an elegant card! You worked the vellum just perfectly. Love the sparkle, too! Just lovely, very classy. I really love your card! What a fabulous card and very different. Something I think I will have to have a go at. Very elegant. Wishing you a very Merry Christmas and I have a new blog to follow for 2017. So pretty. Thanks so much for sharing this. Lovely! The colors are so soft and calm. From the soft sprigs background to the vellum to the lovely wreath, your card is an elegant work of art! Stunning! Thank you for being part of Taheerah's Extravaganza; you've sent my festive spirit soaring! Very beautiful and elegant. Love the soft background and the sentiment is so elegant and stylish. Your wreath is so festive, love the vellum. Really like this “wreath” since it is different and joyful, too. Your background is so elegant! Thank you so much for sharing! Love the sentiment! Beautiful card! What a great eye ! Stunning design! A perfect card for an Australian summer or a Northern winter! Merry Christmas to you and your family. I hope you had a wonderful day! Love the background you created with that soft green! The wreath looks amazing on the vellum! So elegant and pretty! !! Thank you, Gayatri for this card. I really love the raised vellum element and the script is beautiful also. Beautiful with the vellum overlay and sparkly accents! Beautiful card!! I love the sentiment. Your card is simple and elegant. Nice card! I like how the vellum looks with the background. I love the soft green background stamping. Your wreath is lovely with the gold sequins. Lovely card – soft vellum, that gorgeous stamped and die cut wreath – perfect! Great card! The vellum is such a great addition! Such a fun card! Love the way you incorporated Vellum into your design. The sequins are a nice touch. So perfect ! Love the mix of pigment and dye ink and the vellum is a great touch. Lovely card…the softness of the background and the pop of the wreath with a bit of bling! Merry Christmas! Beautiful card! Love the stamped vellum!!! how beautiful! I love that wreath! Very pretty card. I really like the background. I love wreaths and yours is beautiful ! Gorgeous card!! Love the background with the vellum on top! The wreath is fabulous with the gold sequins!! A lovely card! I love the background you created and how you put the wreath on vellum and popped it. Awesome card. Thank you for sharing. I like your simple Christmas card! I so need that sentiment! I love your background in muted green, and then the bold pop of red on the bow. Great job. Love the vellum layer – – I need to remember to use vellum. Gorgeous! Love the vellum layer on top of that soft, muted background. So lovely and elegant. Thanks for sharing. Gorgeous card Gayatri! I love that sentiment stamp! Love the background and the vellum! Pretty card. I like the leafy ink colour on your background and the scripted sentiment goes perfect on the card. I LOVE this beautiful wreath! Lovely card!! So soft and pretty!! Love the idea of a not complete wreath! Thanks for sharing your card. I feel like I could reqch out and touch the velvet on the ribbon. Awesome card. I like the pop of color. I like the pretty leaf background and the fab use of vellum! Beautifully done! I love the vellum and the gold you added to its edges. Such a lovely touch! Absolutely stunning!!! Happy New Year!!! Gorgeous! The red dots and sequins really make that gorgeous wreath pop! This is just stunning, Gayatri!! I love the use of the vellum to mute the background slightly and the use of the bright red and the sequins as they truly make your card POP! Love it! So pretty and elegant. What a beautiful & elegant card you've created & shared with us! Thank you so very much 🙂 it's quite lovely! What a lovely, classy card! I love Clearly Besotted stamps! Beautiful card. I am learning about so many different stamps from the different companies. Thanks for sharing and inspiring. I love the layers in this card. Very nice card and the little details are perfect! Your card is pretty and I really like the background stamping! Absolutely gorgeous! I love all the little details you've done. Beautiful card. Love that sentiment. Very pretty!! Lovely card, love your use of vellum, gives it a nice touch. Thanks for sharing! Fabulous card..love the subtle background. You know, using vellum really does make a card sometimes!